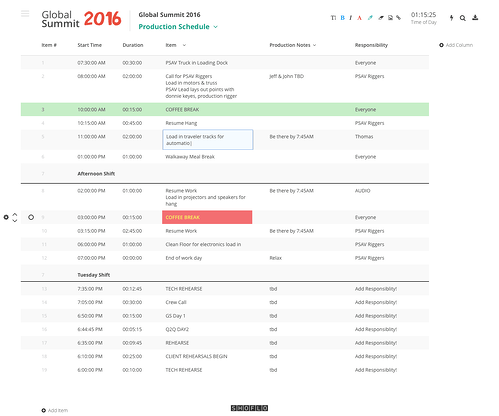 The Production Schedule is the master timeline for coordinating live event production teams. It details what the various productions teams including audio, video, lights will be doing over the course of an event onsite. The production schedule is created during the “pre-production” phase of a project and will go through numerous versions as changes are identified along the way. Typically created and managed by the production manager and/or the production coordinator, the production schedule is the primary source of truth for vendors, contractors, and the greater production crew leading up to and while on show site. The production schedule starts to form as soon as the production company has a basic understanding of how many days of show, rehearsal, and loadin there are. It usually starts with a 30,000 foot view of the days and then becomes more detailed as you get closer to the event. There are a wide range of items that can be detailed in a Production Schedule, but the usual suspects include call times for the crew and vendors, blocks of time identified as loadin, meal breaks for the crew, client rehearsals, staging meetings, technical rehearsals, show times, and loadout. The production schedule is primarily managed by the production manager and/or the production coordinator. It is heavily influenced by the Producer and the client as well; as they are dialing in their vision for the show, the production schedule will adapt along the way. Ultimately, the production schedule is simply the plan for how to prepare for and ultimately execute a live show. Production schedules are critical for the success of any live event production, as it states clearly what the expectations are for the various vendors and crew on any given day. It is important that AV vendors as well as show crew look at the production schedule ahead of a show so they can identify problem areas. For example, if the production schedule states that there is only half a day for loadin, with rehearsals starting at 2pm, the show crew may raise the concern that there is simply no way that the PA will be flown in time for a rehearsal that afternoon. While production schedules are critical, they need to be honest and realistic. If a production schedule states that loadin will be done by a certain time, yet that is not likely to happen, it will simply have a compounding impact on the rest of the schedule. This will result in either a terrible show experience for the attendees and crew or unplanned overtime cost as your crew works through the night to catch up before the next day. Either way, you are likely going to have an unhappy client, an unhappy crew, or both. Keeping your production schedule realistic is a key responsibility of the production company. Production schedules are burdened with countless versions along the way; it is a very dynamic document that is always changing. Excel is limiting and requires printed versions and email attachments, which often get lost in the mix. Modern production teams are moving to real-time, collaborative event production software solutions like Shoflo, where the format and structure of production schedules are clean and the version handling is eliminated. The key benefits of using tools like Shoflo are that you can build other production documents like run of shows and you can easily share production documents with your crew. Are you ready to create, edit, and collaborate on production schedules in real-time, from any device? Request a trial of Shoflo to get started.